Poor little birds have no water to drink. I’ve set out a heated base with a water dish on it. Hopefully, this will allow our wild friends a sip of water now and then, so they can continue their rowdy lives in west Wichita. 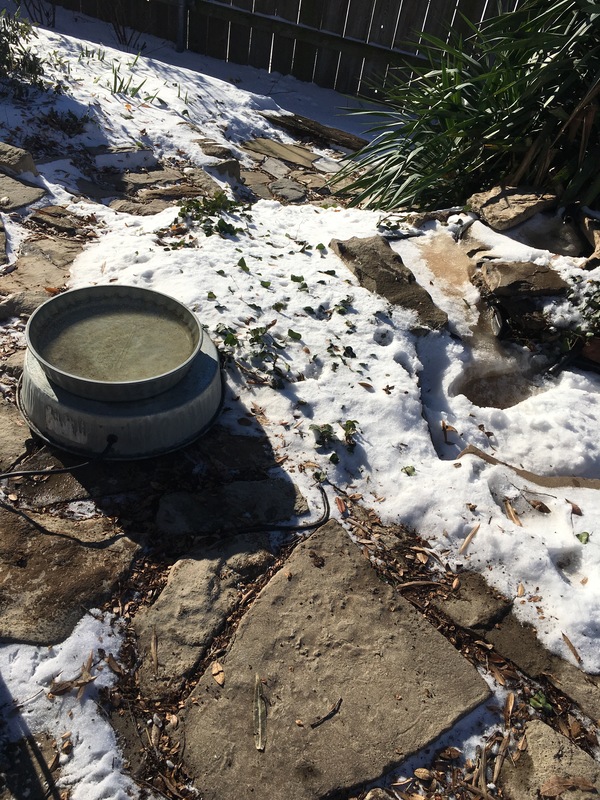 From the comfort of my writing desk, in the swivel chair, I notice that the ‘water feature’ in our back yard has completely frozen. The pump has stopped its faithful pumping, which has stopped the gentle trickle from pool one to pool two to the main pond. I am always pleased to see the winter birds return to the back yard haven we’ve built; dark-eyes juncos, black-capped chickadees, cardinals, blue jays, and the cedar wax wings. I haven’t put food out for years. After all, I don’t want a bunch of moochers on my hands. Plus bird seed tends to draw the ‘junk birds’, too. Grackles and starlings show up in flocks; they have little regard for conscientious potty procedures. Poop somewhere else, I say. Not a world changer. Not my job today. Today, my job is to set out water for the thirsty.